Fortnite account merges are now possible, a little over half a year after cross-platform incompatibility issues came to a head. 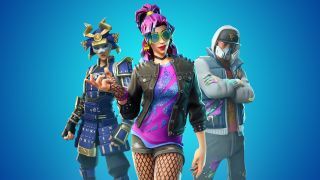 Everybody who had to split their play time between an Epic Games account associated with PS4 and an Epic Games account associated with Switch or Xbox One can finally get all of their items in one place, though the process does have a few technicalities you should know before starting. Find some inspiration for your own cool builds with our list of the best Fortnite creative codes. Here's the biggest one: the merging tool will only help Fortnite players who are still dealing with the aftereffects of those cross-platform problems. One of the accounts you want to merge must have played on PS4 before September 28, 2018 (when Fortnite cross-platform issues were finally sorted out), and the other account must have played on Switch or Xbox One before that date. You cannot merge two accounts on the same platform. Additionally, neither of the accounts you're trying to merge can be banned or disabled. The merger process itself is straightforward: pick the primary account you want to keep using, and the secondary account you want to move all the stuff over from (you'll need access to the email addresses used for each so you can copy in authentication codes). Once you confirm, the PSN / Nintendo Online / Xbox Live logins on your secondary account will be instantly transferred to your primary account. Don't see all your stuff? Don't panic! You'll have to wait two weeks for the V-Bucks and cosmetic items you had on your secondary account to appear on your primary account. A holding period to make sure you're not trying anything phishy like stealing somebody else's account, I guess. A little more fine print: not everything will make the jump. The biggest stuff you'll have to leave behind on your secondary account are any Creative Mode Islands you've built and any Save The World mission/level progress (individual items like Llamas and Heroes will transfer). So if you got super into Creative Mode or Save the World on that second "throwaway" account, you may actually want to use that one as your primary instead. Either way, all of your Fortnite Battle Royale stuff will be safe. Looking for some more battle royale fun? Have you heard of this little game called Apex Legends?